COLUMBUS, Ohio — The first U.S. study on child drownings in portable pools finds that a child dies every five days in such a pool during warm-weather months, demonstrating a considerable risk and the need for consumer education and affordable protection devices, the study's senior author says. The research being published Monday in the journal Pediatrics shows 209 deaths and 35 near-drownings of children under 12 from 2001 through 2009. Most of the children, 94 per cent, were under 5, and 81 per cent of the incidents happened during summer months. 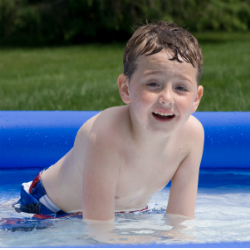 "The anecdotal evidence was suggesting that because portable pools are readily available in many convenience stores and malls, and they're relatively cheap, parents would pick them up, take them home, quickly assemble them, and all this would be done without a lot of forethought about the safety aspects," said senior author, Dr. Gary A. Smith, director of the Center for Injury Research and Policy at Nationwide Children's Hospital in Columbus. Many safety methods used for permanent pools, such as fencing, pool alarms, safety covers and removable or lockable ladders, are too expensive or not available for families who purchase portable pools, said Smith, who also is a pediatrics professor at the Ohio State University College of Medicine. The Association of Pool & Spa Professionals supports "layers of protection," and the study underscores the importance of active, undistracted adult supervision, said Carvin DiGiovanni a senior director at the Alexandria, Va.-based association. "The primary layer of protection is constant adult supervision supplemented by barriers, alarms and other related devices," he said. "We encourage homeowners to purchase the additional layer of protection that works for them knowing that they would be more likely to use it." The study shows that children were supervised by adults in fewer than half, 43 per cent, of the drownings and near-drownings, and that most, 73 per cent, were at home. Among other data, the report shows CPR was administered before emergency crews arrived in 15 per cent of the fatalities and 17 per cent of near-drownings, numbers that help show "it's time for us to begin requiring that people learn how to do CPR," perhaps by adding it to high school curricula, said Susan Baker, a professor at the Johns Hopkins Center for Injury Research & Policy in Baltimore. "That to me is a reminder that every one of us ought to be knowledgeable about how to do CPR and willing to jump in and do it immediately," said Baker, who was not involved in the study. Smith said drownings overall represent the second-leading cause of injury deaths among young children and are different from other childhood accidents because there's no second chance. "I tell parents that drowning is quick, it's silent and it's final," he said.